Charlie Lee is the man to go to for all of your concrete construction services. Hiring Lee Concrete Construction for your project means you’ll be utilizing the services of an Ashland firm supporting the local economy. All Lee Concrete Construction workmanship is completely guaranteed. The firm is fully insured and all employees are covered by worker’s compensation. Charlie prides himself on keeping updated with new concepts and methods to provide his customers with a premium job. Stampcrete, or concrete stamping, is an innovative way to give your home a creative look. Stampcrete provides greater versatility with a variety of patterns from which to choose. Stampcrete comes in a multitude of colors. 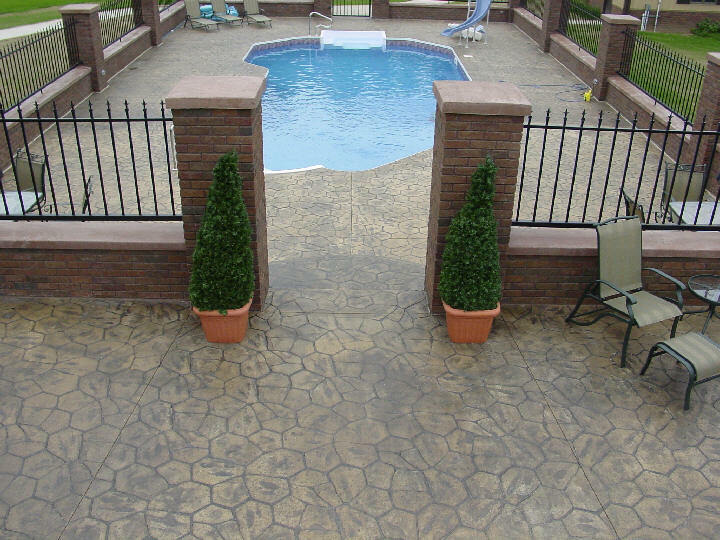 With this option, your pool deck or patio can be made to look like brick, fieldstone or slate without the maintenance of pavers. For your next project try something new with Stampcrete by Lee Concrete Construction. Charlie designs a lot of contracted concrete jobs. Customers requesting decorative work are provided with detailed designs so they will know exactly how the finished product will look. Contact Charlie today to sit down and discuss your options.